Ms. 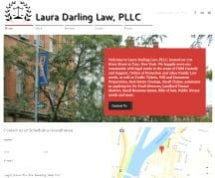 Darling earned her law degree from Albany Law School, and only a year after finishing law school she co-founded a law firm, which has now become Laura Darling Law, PLLC. Since going into private practice, she has quickly earned a reputation as one of New York state's most promising young lawyers. Whether your legal need stems from a delicate family law issue, the wish to create a solid estate plan or a legal challenge in one of the firm's other practice areas, you can turn to Laura Darling Law, PLLC.